The Rein's Ring Claw offers you a large body with ringed claws and little feet that attract fish from all around. Heavy salt concentration, and our unique shrimp scent keep the fish on all the way to you. 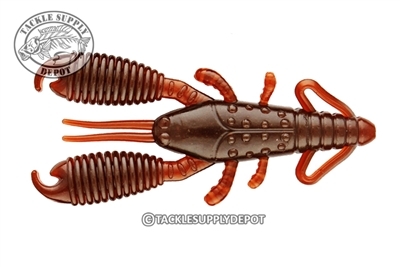 This 3" craw is amazing in cold water, use it by itself on a ball head jig or a finesse jig trailer in 30 degree water and Fish it slow, you will catch fish. Pitch and flip the 4" version in summer. Great bait !!! The smaller version Ring Claw is amazing on Jig trailer if you trim your jig skirt properly to the bottom of the hook.